Few things go together as well as peanut butter and jelly. They're a classic combination that most kids can't get enough of. At least my kids can't get enough of them. I think my youngest son would eat peanut butter and jelly for every meal if I'd let him. 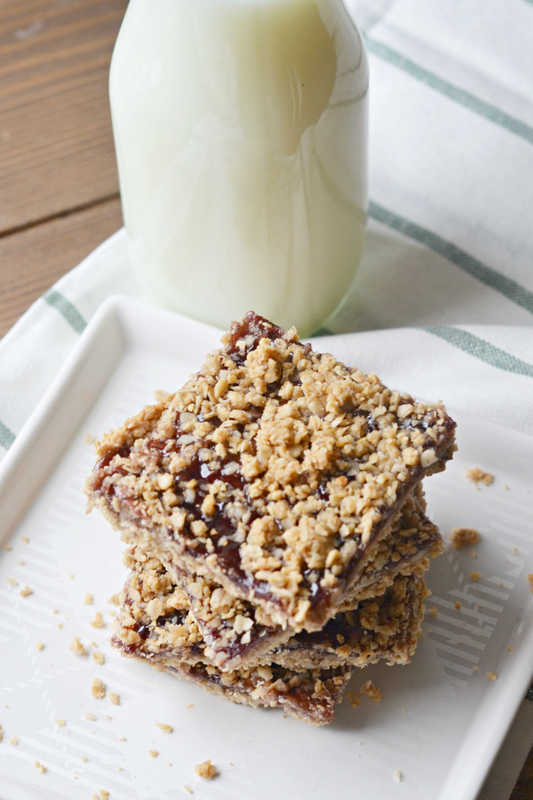 That might be why he loves these Peanut Butter and Jelly Oatmeal Bars so much! 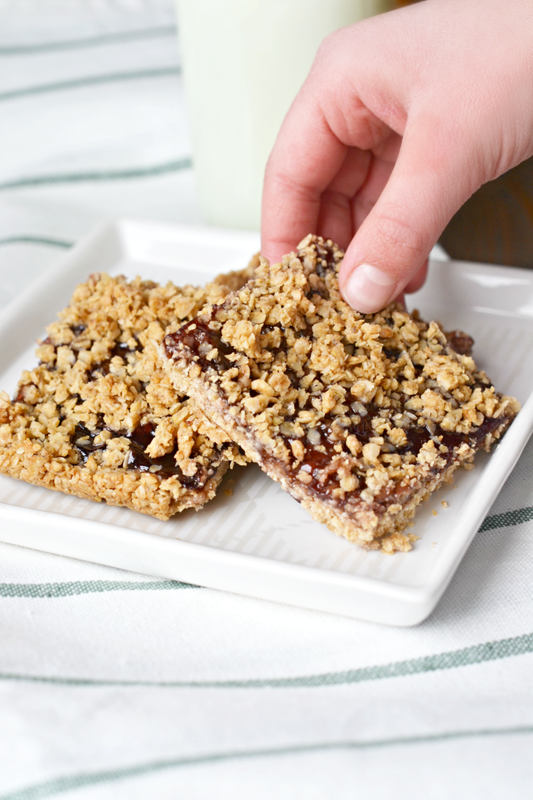 They are perfect served at breakfast, lunch, or snack time. Looking for a delicious recipe that your kids will love? Here's a great one to try! 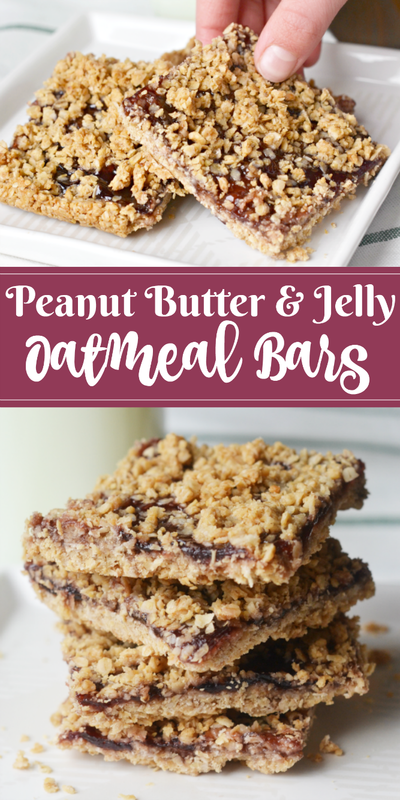 In an effort to keep these Oatmeal Bars more on the healthy side of the snack spectrum rather than the dessert side, I tried to use as many wholesome, natural ingredients as I could for these Peanut Butter and Jelly Oatmeal Bars. I even used Jif Natural Creamy Peanut Butter. I've gotten to where I prefer the natural version of peanut butter. Have you tried it? 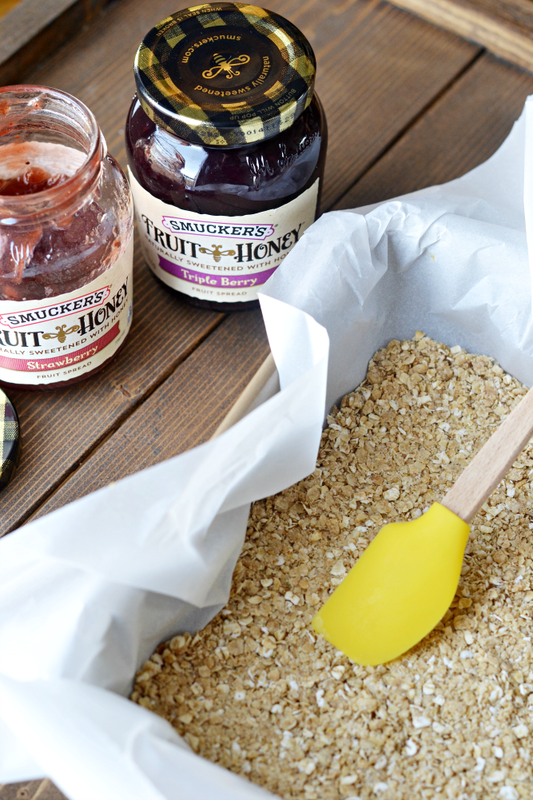 And Smucker's Fruit and Honey Jam is one of my favorites! 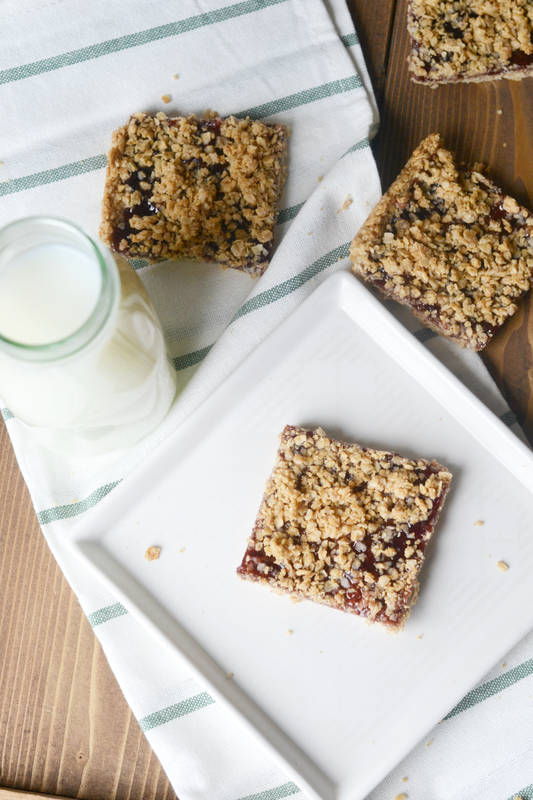 We picked up the ingredients we needed for these oatmeal bars while on a grocery run to Target. I have to confess that Target is truly one of my favorite places to shop. I mean...just look at the cute Valentine's Day items near the peanut butter and jelly. See? They get me every time. I also love Target for their coupons and their Cartwheel savings app. As a mom with three kids--two of whom are boys already eating me out of house and home at the ages of 5 and 3--I use several rebate/savings apps to help save on groceries. (Maybe I need to share them all in a future blog post.) The Target Cartwheel app is one that has saved me hundreds. You just download the app and use the scanner feature to scan your items as you place them into your cart. The app will let you know if there are discounts available for that item. Then you have the cashier do one final scan at checkout and you've saved on your shopping trip. Oh, and I have great news! 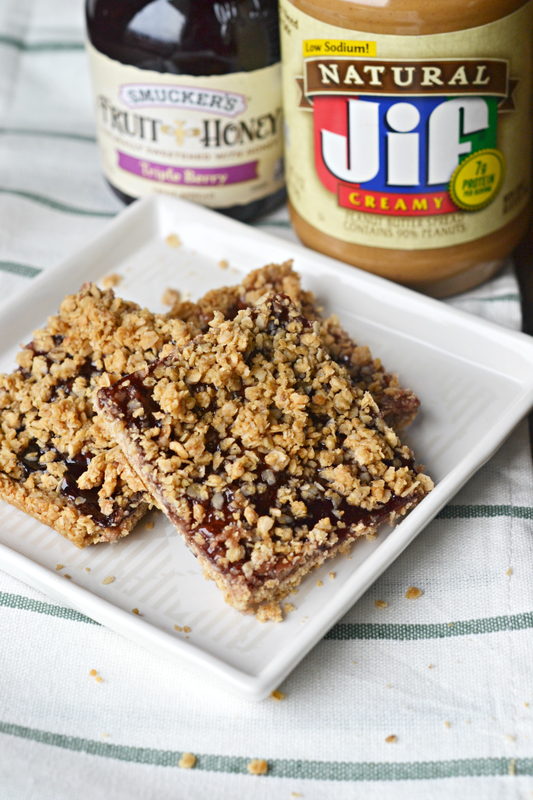 There are currently Cartwheel offers for both Jif and Smucker's! Now you can save on the two main ingredients needed for this recipe. 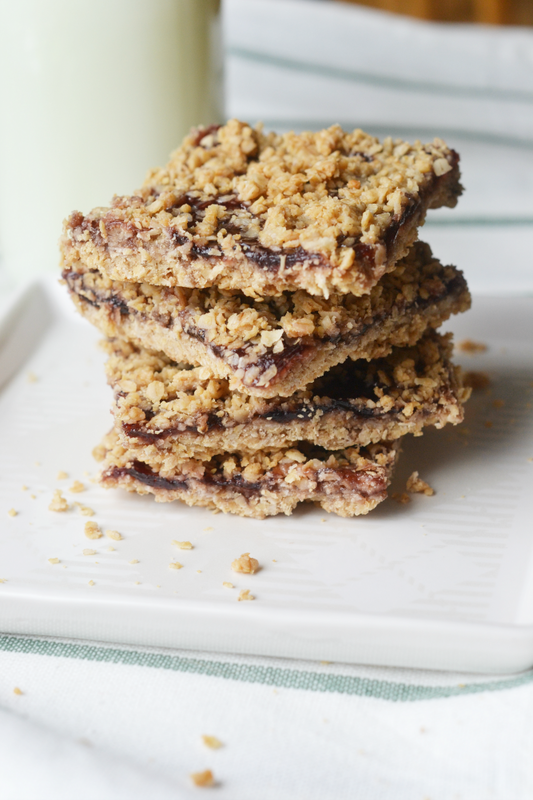 Ready to grab those ingredients and try this peanut butter and jelly recipe for yourself? Here it is! Line an 8 in. by 8 in. baking pan with parchment paper and preheat the oven to 350 degrees. Use a food processor or blender to grind one cup of uncooked oatmeal into an oat flour. Pour this into a large mixing bowl. Add the second cup of uncooked oatmeal to the oat flour. Set the bowl of oats aside. On the stovetop or in the microwave, melt together peanut butter, coconut oil, and agave sweetener. Once the mixture is completely melted stir in the vanilla extract. Pour the peanut butter mixture into the bowl of oatmeal and use an electric mixture to blend the ingredients together. A rough, crumbly dough will form. Measure out 1/3 cup of the peanut butter mixture and set it aside. Press the remaining mixture firmly into the lined baking pan. Use a spatula or spoon to pack the mixture into the bottom of the pan. Gingerly spread the jelly or jam over the peanut butter mixture trying not to move it around too much. Scatter chia seeds evenly over the jelly if desired. This is optional but adds a little boost of nutrition. Sprinkle the reserved 1/3 cup of peanut butter dough over the jam. Bake in the oven for 25-30 minutes. Let the bars set and cool completely. Cut and serve. Refrigerate leftovers. 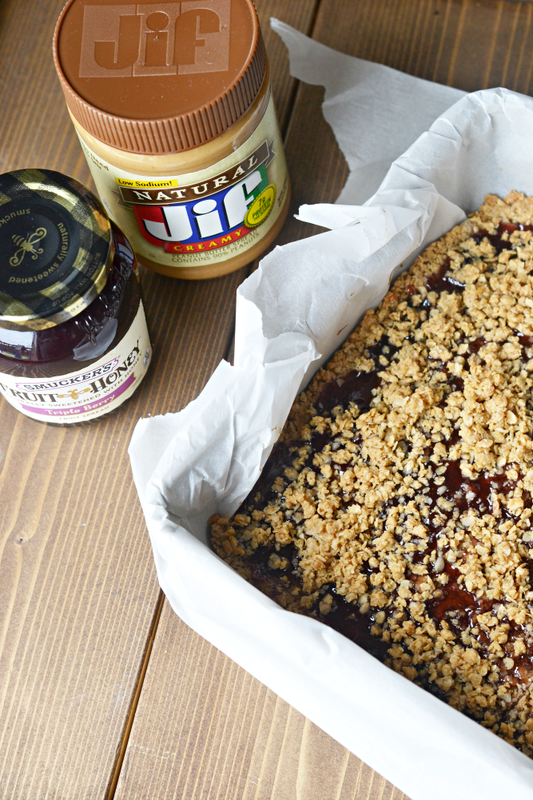 Do your kids love PB&J? 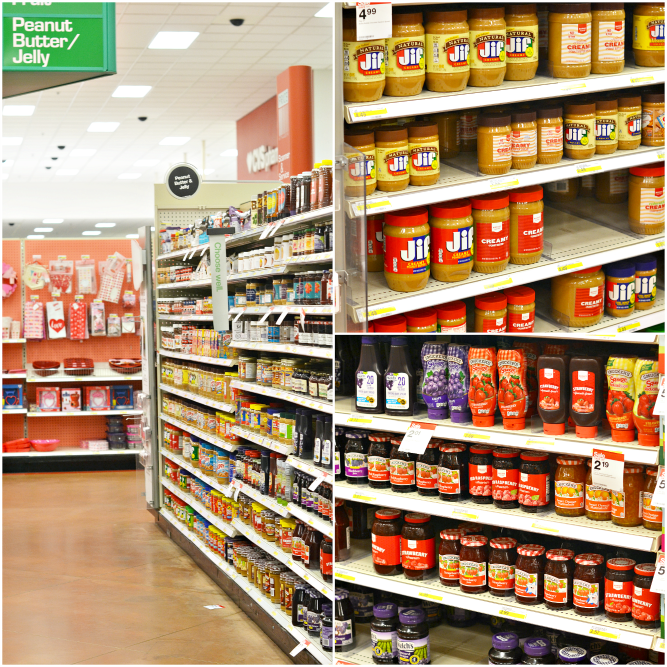 Save with Target's Cartwheel app on both peanut butter and jelly by clicking here and here. 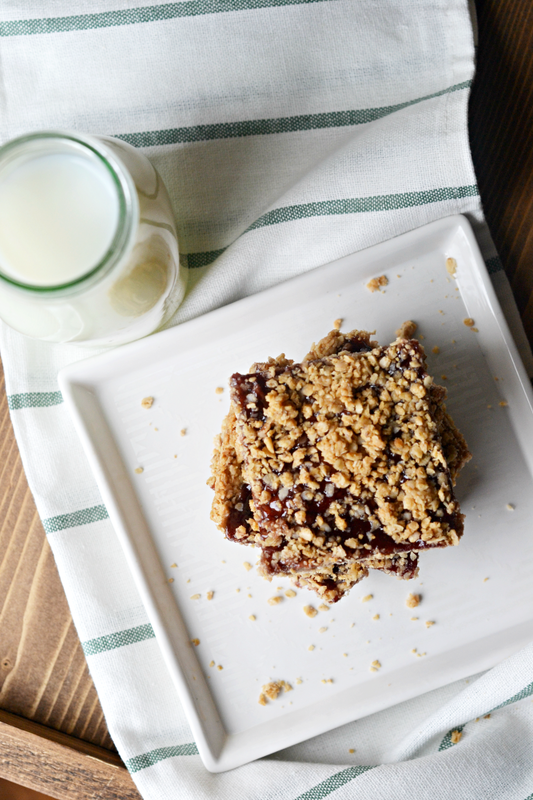 Oh, and enjoy the peanut butter and jelly bars! These look delicious! How long do they stay good?